Q.I'm worried about running with Stadium Runners for the first time, what if I get left behind? A.Most runners get anxious about running with a new club or group. If you are able to run continuously for 30 minutes either on the treadmill or outside, then you should be able to run with the club’s Bronze group. It is a principle of Stadium Runners that no one ever gets left behind. There are always trained run leaders accompanying the groups. Their role is to guide you around the route, help everyone enjoy the run and ensure that no one is left behind. Q.I can't run for 30 minutes, what can I do? A.In order for the Run Leaders to manage the groups it is important all runners can run continuously for 30 minutes. If you need some advice and a simple programme designed to increase your running endurance please contact Saul Muldoon the Club Coach. Q.What does a typical running session involve? A.Following a short briefing to let runners know about the latest club news, forthcoming events and other information, we move outside for a warm-up as a large group. Following this the large group splits in the Bronze, Silver and Gold groups for separate runs. All the groups return at about 8pm to stretch and compare notes about how tough their run was! 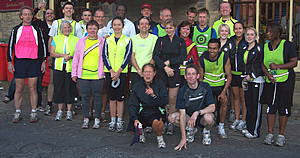 In addition to the regular runs the club has various other events including track sessions, fun races, relays and social runs which take place regularly throughout the year. Q.I'm not sure which group I should be running with? A.There is a guide to the various groups on this page, if you are still unsure after reading this please speak to Saul Muldoon the Club Coach. Many Stadium Runners have found that as their running improves they are able to progress from the Bronze to the Silver and even the Gold groups. Q.I don't like running up hills, do you do any flat runs? A.Being a runner in Huddersfield means that running uphill is inevitable! However regular training on hills improves both your physical and mental endurance making you a better runner. Look on the hills as just another part of the run which contributes to the overall experience. Take the hills at your own pace and remember that the Run Leaders will ensure no one gets left behind. During the summer the training runs will involve off-road sections including footpaths, bridleways and canal towpaths (which are about as flat as it gets!) In the winter all the runs take place on well lit roads and pavements for safety reasons. Q.I'm not a member of the Stadium Health & Fitness Club can I run with Stadium Runners? A.Both Health Club and non Health Club members are welcome to run with the club. Health Club members are able to run for free, non health Club members should pay the current “Pay & Play” class fee at the Health Club reception prior to the run. Q.Is Stadium Runners a “proper” club? A.Stadium Runners is a fully constituted club managed by an elected committee of volunteers, any member of Stadium Runners is welcome to attend and contribute to committee meetings if they wish. Stadium Runners is also affiliated to a recognised athletics governing body which affords members certain benefits including reduced price race entries. It currently costs £10 per year to join Stadium Runners to take advantage of these and various other benefits. 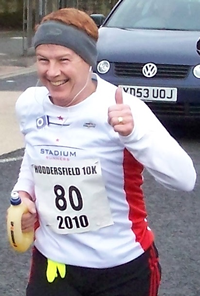 Q.I fancy having a go at a local 10K can I race as a Stadium Runner? A.To compete for the club you will need to be a paid up Stadium Runner. All paid up members of the club are entitled to race under the club name and wear club kit for competition. Many Stadium Runners enjoy the challenge of racing take part in the club’s season long Grand Prix and WAVA Championship based on a calendar of selected events. This ensures that you’ll have competition with (and support from) your club mates at races on the club calendar. Q.I'm not that interested in racing, can I come to the club just to run? A.Stadium Runners recognises that people have different motivations for running. For some these many be competitive but others may wish to run for fitness, social or other reasons. This inclusive approach is central to the club and there is no pressure to race if you do not wish to do so. Similarly there is no expectation that you attend every Monday and Thursday training session, simply turn up and run as often as you are able to. Q.Can I come along to see if I like the club before making the commitment to join? A.Of course come along and run with us for a few weeks to see if we are the running club for you. If so great, if not no problem!